ZTE Corp.’s shares cratered after it agreed to pay at least US$1 billion in penalties and overhaul its management as part of a sweeping settlement agreement that allows it to resume business after a two-month hiatus. China’s second-largest telecoms equipment maker fell as much as 41 per cent as it resumed trading in Hong Kong following a suspension since April, when the U.S. imposed a ban on purchases of vital American technology in punishment for Iran sanctions violations. Its Shenzhen stock slid by the daily maximum of 10 per cent. ZTE agreed to pay US$1.4 billion in total penalties, including a lump sum payment of US$1 billion and a suspended penalty of $400 million, it said in a filing with the Hong Kong stock exchange. The settlement also calls for replacing the entire boards of both parent ZTE and subsidiary ZTE Kangxun within 30 days of the order, as well as terminating all current members of senior leadership at both companies. The company’s future remains uncertain. 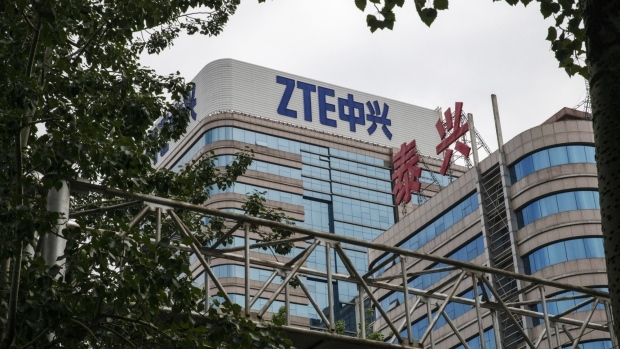 The U.S. Senate advanced legislation to restore penalties on ZTE, after President Donald Trump advocated for the Commerce Department settlement easing restrictions. The Senate voted 91-4 late Monday to begin debate on the National Defense Authorization Act, including an amendment that will keep restrictions on ZTE. The provision was included on a list of amendments that is backed by both Republicans and Democrats. The Shenzhen, Guangdong-based company is said to incur losses of at least $3 billion as a result of the U.S. action. Analysts at Jefferies gave a price target of HK$14.41 in a research note, down from more than HK$25 before the suspension. Citi analysts targeted HK$15. Commerce Secretary Wilbur Ross said the legislation that would restore penalties on ZTE is not a certainty as the measure still needs final approval. “We’ll see if it does” get through Congress, Ross said in an interview in Washington on Tuesday. The U.S. blocked ZTE’s ability to buy from U.S. suppliers in April, saying the company violated a 2017 sanctions settlement related to trading with Iran and North Korea and then lied about the violations. That choked off supply of the chips and other components it needs to make networking gear and smartphones, forcing the company to grind to a halt just weeks later. ZTE, in its filing, detailed extensive steps it will take to comply with the settlement. The company will complete and submit nine audit reports of its compliance with U.S. export control laws. It plans to assess the full impact of the April 15 U.S. export denial order and disclose an updated financial reports.